Every book should contain a few completely wrong statements, just to encourage readers to think for themselves. Many books already adhere to this policy, although it’s not always intentional. The purpose of this chapter is to examine how the airplane responds to pure vertical motions and to pure rolling motions. We will see that the airplane vigorously resists such motions ... unless it is in or near the stalled regime. For a non-streamlined object like a pompom, if you wave it through the air, it will resist the motion, due to ordinary air friction. An airplane has friction, too, but we will see that there is another process (“aerodynamic damping”) that is enormously more powerful than friction. This strong aerodynamic damping should not be taken for granted, since you can certainly get an airplane into situations where the damping goes to zero or becomes negative. This is why the airplane is hard to fly near the stall. We will discuss how to deal with and/or prevent such situations. Normally, the airplane is in equilibrium — all forces are in balance.1 Let’s consider the vertical forces in particular, and see how the airplane maintains its equilibrium. To see how the wing reacts initially2 to eliminate any unbalanced vertical force, consider the scenario in figure 5.1. The lift decreases if you lose airspeed because of a sudden windshear. 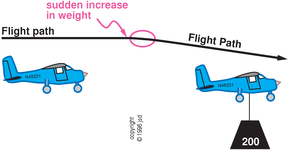 The load on the airplane (the effective weight) increases in a steeply banked turn. The weight increases if a giant condor flies in the window and sits on the seat beside you. Since we are analyzing the initial reaction, we will assume there has not yet been any change in the pitch attitude. For a brief instant after the weight increase, there will be an unbalanced downward force. According to Newton’s second law, this will result in a downward acceleration. This in turn means the airplane will begin to descend. If the downward force remained unbalanced, the airplane would continue to accelerate downward. It would not just go down, it would go down faster and faster and faster. This is not what happens, for a very interesting reason. As soon as the wing picks up an appreciable downward velocity, its angle of attack will be different. As we discussed in section 2.2, angle of attack is just the angle at which the air hits the wing. In figure 5.2 we see that the air hits the wing at a larger angle during the descent; the pitch attitude of the airplane has not changed, but the relative wind is coming from a new direction, ahead of and below the airplane. This increase in angle of attack normally results in an increase in coefficient of lift. The extra lift balances the new weight, and equilibrium is restored. As we shall see, an airplane normally has very strong vertical damping, and this is crucial for normal flight. Unbalanced downward force makes downward acceleration. Downward acceleration leads to downward velocity. Downward velocity causes increased angle of attack. Increased angle of attack causes increased upward force. This continues until upward force equals downward force. The final state is a steady descent, with no further acceleration because the forces are once again in balance. If the extra weight were removed, the airplane would return to level flight at the original angle of attack. This strong vertical damping is the reason why we almost always assume that lift equals weight.4 If the forces were out of balance, the airplane would accelerate upward or downward, and the angle of attack would change until balance was restored. In practice, balance is restored so quickly that weight is never significantly different from lift. I reiterate that this chapter considers only the initial response of the wing alone; the longer-term response of the airplane as a whole (including the horizontal stabilizer) is discussed in chapter 6. Vertical damping may seem obvious — but it is not. You should not take vertical damping for granted, because it doesn’t always exist. In the stalled regime, there is a negative amount of vertical samping, as we now discuss. Let’s repeat the previous experiment, but this time let’s imagine that the airplane was flying at a rather low airspeed (higher angle of attack) when it picked up the added weight. This is analyzed in figure 5.4; note the higher angle of attack when compared with figure 5.3. As before, the added weight causes a downward acceleration. As before, this leads to downward velocity. As before, this causes increased angle of attack. Surprise! 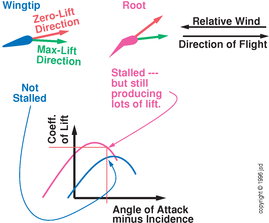 the increased angle of attack causes no increase in upward force, because the coefficient of lift does not increase forever as a function of angle of attack. Now we find ourselves in a really nasty situation. Even if the extra weight were removed, the airplane would continue to fly at the new angle of attack — the very high angle of attack depicted on the right-hand side of figure 5.4. The airplane would continue to descend, and even accelerate downward. Let’s investigate the stalled regime more closely. The critical angle of attack is the point where further increases in angle of attack do not result in a further increase in coefficient of lift. 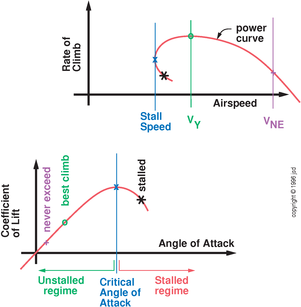 The unstalled regime refers to angles of attack below the critical angle of attack; the stalled regime refers to angles of attack beyond the critical angle of attack. The critical angle of attack corresponds to a specific airspeed, which is called the stall speed. However, it is always better to think in terms of angle of attack (rather than airspeed). In particular, at very high angle of attack, the wing is very thoroughly stalled, but you would not know this by looking at the airspeed indicator, because the airspeed is well above the so-called stall speed. As a related point: It is common but somewhat sloppy to say a stall “occurs” at the critical angle of attack. However, it is better to say that the stalled regime begins at the critical angle of attack. That is, it is better to think of the term stall as applying to the stalled regime as a whole, not just to the critical point at the boundary between the mushing regime and the stalled regime. The stalled regime was introduced in section 1.2.5. A number of peculiar things happen in the stalled regime, including a lack of vertical damping, as discussed in section 5.2.2. Roll damping is also impaired, and eventually becomes zero and then negative, as discussed in section 5.4.2. In this section, we discuss the structure of the power curve in the stalled regime, continuing the discussion from section 4.5. The critical point is a special point on the coefficient of lift curve. Not coincidentally, this corresponds to a special point on the power curve. It is worth exploring this relationship further. 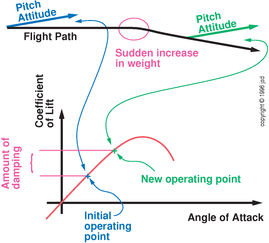 Figure 5.5 shows two curves: the vertical speed versus airspeed, and the coefficient of lift versus angle of attack. As discussed in section 2.13, there is a deep relationship between airspeed and coefficient of lift; if the coefficient of lift is small the airplane has to fly at a higher speed to support its weight. Since the coefficient of lift has a maximum, there is a minimum usable airspeed. This is called the stalling speed, and is denoted VS.
5.3.2 Flying Beyond the Stall? No, it is not possible to sustain flight at an airspeed below the stalling speed. In the lower part of figure 5.5, the coefficient of lift curve does not end at the stall, it just goes horizontal and then bends downward. Similarly, in the upper part of figure 5.5, power curve does not end at the stall, it just goes vertical and then bends back underneath. The rightward bend in the latter is related to the downward bend in the former. To say the same thing another way: in the stalled regime, the coefficient of lift decreases with increasing angle of attack, so the airspeed required to support the weight of the airplane must actually increase as the airplane becomes more and more deeply stalled. In the stalled regime the aircraft has a high and increasing coefficient of drag.5 Therefore it takes a lot of power to maintain level flight in this regime. At constant power, the rate of climb decreases (or becomes more negative) as the aircraft becomes more deeply stalled. A typical point in the stalled regime is indicated by the black six-pointed star in figure 5.5. Flight in this regime — flying beyond the stall — is very peculiar. If some disturbance gives the airplane a slight upward velocity, it will accelerate upward and become less and less stalled. Conversely, if some disturbance produces a slight downward velocity, the airplane will accelerate downward and become more and more stalled. If you lower the nose the airplane will ascend; if you raise the nose it will descend. This sort of flying is no fun at all. However, even in the stalled regime, the wings are producing enough lift to support the weight of the airplane. Lift does not go to zero at the stall. Indeed, the coefficient of lift is maximized at the stall! The stall is a problem not because of loss of lift, but because of loss of vertical damping. Vertical damping is very important. In some aircraft, the stall occurs quite suddenly, because there is a rather sharp corner in the coefficient of lift curve, as shown in figure 5.6. Just below the critical angle of attack, there is good vertical damping; just above the critical angle of attack there is strongly negative vertical damping. Most aircraft are not so nasty. For the coefficient of lift curve shown in figure 5.5, the vertical damping goes away gradually as you approach the stall. The aircraft will handle about the same one degree below the critical angle of attack or one degree beyond the critical angle of attack. We will defer until chapter 18 a discussion of what causes the stall, i.e. what properties of the airflow cause the coefficient of lift curve to bend over. In section 5.2 we considered how the airplane would respond to an unbalanced force that was purely vertical. Now let’s consider how it responds to an unbalanced force that causes a roll-wise torque.6 For instance, imagine several large passengers suddenly got up and moved to the left side of the airplane. This scenario is depicted in figure 5.7. To understand this situation, we use the same logic as in the previous section. 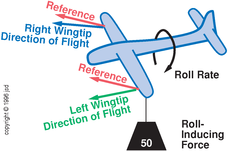 Remember, the angle of attack is defined to be the angle between a reference pointer (welded onto the wing, shown in red in the figure) and the direction of flight through the air. Although the nose of the airplane is still moving straight ahead, the left wingtip is moving ahead and down, while the right wingtip is moving ahead and up. This means the left wingtip is operating at an increased angle of attack, while the right wingtip is operating at a reduced angle of attack. The front wheel of a bicycle is only lightly damped (assuming the bearings are in good shape and the wheel is not touching the ground). The rolling motion of an airplane is quite heavily damped (in the unstalled regime). If you give the wheel a shove, it will keep spinning around and around for a long time. If you give an airplane a shove (e.g. by deflecting the ailerons for just a moment) it will not keep rolling. The rate of roll goes away almost as soon as the roll-inducing forces go away. If you keep shoving on the bicycle wheel, it will accelerate: rolling faster and faster. This is the rotational version of Newton’s second law: angular acceleration is proportional to angular force (i.e. torque). If you deflect the ailerons, you will get a roll-wise acceleration, but only for a short time. Thereafter, if you maintain the same deflection, the wingtip-to-wingtip difference in angle of attack will generate forces that prevent any further angular acceleration. You get a steady roll rate, proportional to the aileron deflection. In a light, single-engine airplane there is so little roll-wise inertia that you hardly notice it. Damping is the dominant effect, not inertia. The ailerons’ job is to overcome the roll damping. As a result, the roll rate is essentially always proportional to aileron deflection. In contrast, in a twin-engine airplane, both inertia and damping must be taken into account. A twin has a lot more roll-wise inertia (because it has those heavy engines mounted way out on the wing, and maybe tip-tanks also). You may notice that it does not respond as quickly to aileron deflection. To initiate a roll, you have to overcome inertia; during this time the rotational acceleration is proportional to the aileron deflection. Eventually the roll rate builds up to the point where roll damping becomes effective — that is, the wingtip-to-wingtip difference in angle of attack prevents further acceleration and in the steady state the roll rate is proportional to the aileron deflection. 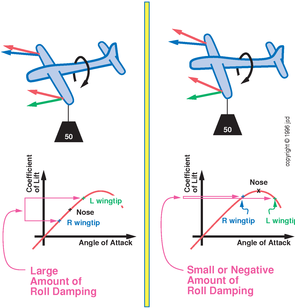 The left side of the figure shows an airplane in a roll, at a normal airspeed. The right side shows the same thing, except that the angles of attack are much higher — at or just beyond the critical angle. Because of the rolling motion, the left (downgoing) wingtip is flying at a higher angle of attack, which (in this regime) produces more lift, compared to the right wingtip. Large forces are generated opposing the rolling motion. Because of the rolling motion, the left (downgoing) wingtip is flying at a higher angle of attack ... but alas it is not producing more lift. In fact, it could well be producing less lift than the right wingtip. The aerodynamic forces do not oppose the initial rolling motion, but could well amplify it. The loss of roll damping that occurs at the stall is quite a departure from normal behavior. This is precisely how you enter a spin or a snap roll: you arrange that one wingtip is flying above the critical angle of attack while the other is flying below the critical angle of attack. All bits of wing contribute equally to the lift, and to the vertical damping. Bits of wing near the root contribute less to the roll damping, while bits of wing near the tips contribute more (because of leverage). So the trick is, we want the roots to stall first. If we set the roots at a higher angle of incidence than the tips, when the wing as a whole attains its maximum coefficient of lift, the roots will be stalled and the tips will be unstalled, and there will still be a positive amount of roll damping. At the stall, the airplane will drop its nose straight ahead, rather than dropping one wingtip. This is a very desirable handling characteristic. This design trick (more incidence at the roots and less at the tips) is called washout. The opposite notion (less incidence at the roots and more the tips) is called washin. Nobody would design a plane with washin.7 Flaps increase washout, as discussed in section 5.5.3. Finally: Deploying the flaps has the effect of increasing the washout. That’s because the flaps are only installed on the inboard sections of the wings. When they are deployed, they increase the incidence of that section, as discussed below. Flaps are important. They are used during landing (section 12.7.2), takeoff (section 13.2) and other low-speed maneuvers (section 12.10 and section 17.1.7). Extending the flaps lowers the stalling speed (the bottom of the white arc). Extending the flaps increases the wing’s angle of incidence. Extending the flaps effectively increases the washout, since on most planes the inboard sections have flaps while the outboard sections do not. Extending the flaps increases drag. This is helpful during landing, but unhelpful during climb and cruise. Extending the flaps perturbs the trim speed. This is an undesirable side effect. See below, and see also section 12.10. Extending the flaps lowers the allowable top speed (the top of the white arc). This is another undesirable side effect. Extending the flaps gives the airfoil a shape that is more resistant to stalling. That means, among other things, that it can fly at a higher angle of attack without stalling, as shown in figure 5.9, especially the left-hand panel. At this high angle of attack it can produce a high coefficient of lift, perhaps as high as 2.5, whereas the same wing without flaps would stall before its coefficient of lift got higher than 1.3 or thereabouts. This higher coefficient corresponds to a lower stalling speed,9 which is important for safety as well as performance. Extending the flaps increases the incidence of the wing as a whole. You have effectively rotated the whole wing by a few degrees. Its leading edge is in the same place, but its trailing edge is lower, relative to the rest of the plane. This is shown in the right-hand panel in figure 5.9. You need to account for this change in incidence, so you can judge angle of attack by looking out the window, as discussed in section 2.4. I always wince a little when I hear someone say “when we extend the flaps it increases the lift”. Well, I hope not. I hope that lift equals weight throughout the flap-extension process. Of course lift would increase if you kept the same pitch attitude while increasing the incidence, but proper technique involves lowering the nose while the flaps are extending, to maintain lift equal to weight. It’s also true that at some later time, we will reduce airspeed, and at that time we will need more coefficient of lift for the same amount of lift. A correct but complicated way to say it is this: extending the flaps permits a higher coefficient of lift. The best way to say it is quite simple: extending the flaps lowers the stalling speed. Extending the flaps raises the incidence of the wing-roots relative to the rest of the wing. That is, it increases the washout. It turns out that this increase in incidence is in some sense larger than the increase in the stalling angle of attack. This has important and somewhat counterintuitive consequences. Consider the typical situation where flaps are installed only on part of each wing. When flaps are extended, the affected part of the wing is flying at a higher angle of incidence, and therefore a higher angle of attack, compared to the unflapped part of the wing. Therefore the flapped section will stall sooner! I know this sounds paradoxical, but it is 100% true: even though the flapped section has a shape that is intrinsically more stall resistant, it will stall before the unflapped section does. This stalling behavior is actually quite useful. As discussed in section section 5.4, to get good low-speed handling, we want the wing-roots to stall first. That ensures we don’t run out of roll damping before we run out of vertical damping. Therefore designers typically install flaps only on the inboard part of the wings. but rather absolute angle of attack minus incidence. This quantity has a simple physical interpretation: it is the angle at which the relative wind hits the fuselage. It has the nice property that it doesn’t depend on which part of the wing is being considered, and it doesn’t change when the incidence is changing due to flap extension. Before the flaps are extended, the wingtip and root have the same shape and the same performance, as shown by the blue curve. When the flaps are extended, the back part of the airfoil rotates down. This means that the flapped section has been rotated to a higher angle of incidence. To measure the incidence, you can look at where each coefficient-of-lift curve crosses through zero. You will see that the magenta curve has been shifted to the left. Another way to see this is at the top of the figure: the zero-lift-direction of the flapped section now points more nose-up. The max-lift-direction has rotated in the same direction by an even larger amount. 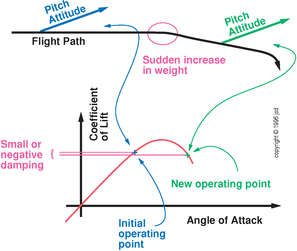 In the situation shown in the figure, the flapped section is flying beyond its critical angle of attack (magenta curve) while the wingtip is flying below its critical angle of attack. This corresponds to a fairly low airspeed, such as might be used for a short-field approach. In this situation, even though the flapped section is stalled, its coefficient of lift is still quite high, indeed higher than what the unflapped section could produce at any angle of attack. Deploying the first notch of flaps (on most airplanes) adds relatively little drag. Deploying the last notch adds much more. The main contribution to the nose-up trim change is that the tail flies in the wake of the wing. The extended flaps give a more downgoing angle to the downwash, which then hits the tail. On aircraft with a high T-tail, such as a Seminole, the tail is much less affected by the downwash from the wings, and there is typically very little trim change with flap extension. Another contribution comes from the drag. On a low-wing airplane, the extended flaps tend to drag the bottom of the plane backward, forcing the nose down. This partially cancels the previously-mentioned effect of the downwash on the tail. Conversely, on a high-wing airplane, the drag of the flaps tends to drag the top of the airplane backwards, forcing the nose up. This adds to the previously-mentioned downwash effect. Therefore we expect high-wing aircraft to have more trim change with flap extension. In a C-152, extending the flaps with the engine at low power causes much less trim change, so in everyday operations you will not become familiar with the large changes shown in the table. However, when you start a go-around, you will have full power and full flaps, and therefore a dangerously low trim speed (something like 45 KIAS). Watch out for nasty pitch-up on go-around! The Skyhawk (C-172) and Skylane (C-182) behave about as badly the C-152. See section 12.10. The top of the white arc (VFE) is quite a bit lower than the top of the green arc (VNO). Flaps are only supposed to be used at low speeds, so the designers didn’t bother making them strong enough to be used at high speeds. Always glance at the airspeed indicator before reaching for the flap handle. The stall occurs at the critical angle of attack, which is the point where a further increase in angle of attack does not create a further increase in coefficient of lift. Lift does not go to zero at the stall. In fact, the coefficient of lift reaches its maximum at the stall. Vertical damping goes to zero at the stall. Roll damping goes to zero at about the same point and for similar reasons. However, a well-designed airplane will maintain a little bit of roll damping even after it has lost vertical damping. The airplane is very ill-behaved near the stall because of the loss of vertical damping and roll damping. It is possible (but impractical) to support the weight of the airplane at an angle of attack above the critical angle of attack. It is not possible to support the weight of the airplane at an airspeed below the stalling airspeed. See chapter 10.1 for a general discussion of equilibrium, stability, damping, and related concepts. This chapter concentrates on the airplane’s initial reaction, taking into account just the wing. In the longer term, the airplane reacts to an increased load by pitching down and speeding up, but this occurs after and because of the effects discussed here, and because the tail gets into the act, as discussed in chapter 6. See chapter 10 for a discussion of damping in general. ... or weight times load factor. For more on the relationship of lift and weight, see chapter 4. See section 4.5 for a discussion of how lift and drag depend on angle of attack, and how this governs the shape of the power curve. In the stalled regime, the induced drag will be about the same as in the unstalled regime at the same airspeed, but the form drag will be much increased. See section 4.4 for a discussion of types of drag. For simplicity, we will consider pure rolling motion. More complicated motions such as Dutch roll can make a (negative) contribution to the damping budget. See section 10.6.1. You can experience washin by flying upside down. A plane that has washout in normal flight will effectively have washin during inverted flight. For this reason, high-performance aerobatic aircraft are often built with little or no washout. Because of an ambiguously-worded passage in reference 15, some people seem to have gotten the impression that the term “washin” was a fancy term for asymmetric incidence. It is not; no engineer (or well-informed pilot) would use the term that way. You should stick with the definitions given here. ... assuming other things like weight are held constant. In books such as reference 26, you will see curves that resemble figure 5.10, in that the coefficient-of-lift curve intercepts the x-axis somewhere to the left of the origin. Figure 5.10 chooses the x-axis so that intercept is equal and opposite to the incidence, but in those other books they choose the x-axis differently, commonly geometric angle of attack or something like that. Their intercept is not related to the incidence except possibly by coincidence. See section 2.15 for a discussion of the choices involved. In the C-152, VFE, the max speed for operating with flaps fully extended, is 85 knots. You can briefly pull on the yoke to get the speed below 85 before extending the first notch of flaps. After that, you won’t need to pull anymore, because of the trim-speed change which is the point of this demonstration.